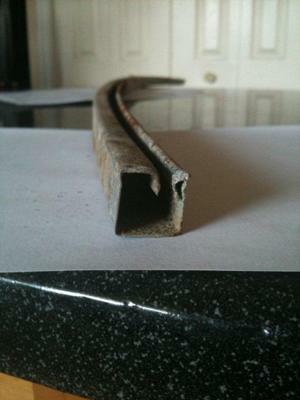 Hi there, Just bought a used above ground pool and cannot find replacement bottom rails. Some were so badly corroded that the previous owner had thrown them away. I'm attaching a picture. The top rails and bottom appear to be the same. Don't know the manufacturer. 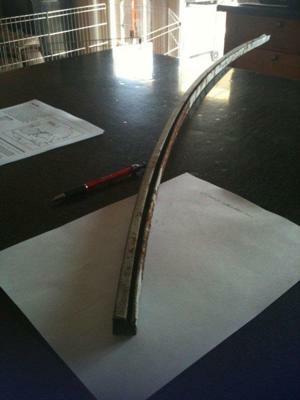 The curved rails are 51" measured along the outside of the curve. Hi Joe. The shape is very similar to a Doughboy so they might make a good replacement. Any store that sells Doughboy parts can order them for you. When using rails from a different pool the most important part is the arc. They are all bent slightly different depending on the pool size and whether they are end rails or side rails. The length is not critical as you can cut them down to size. A Doughboy pool would not have the same rails on the top and it would not have straight rails, so you have some other brand. Most other brands have the groove in the dead center, not offset like the ones you have that are similar to Doughboy. Wish I could see photos of the rest of the pool. These look the same as the rails on my Trevi pool, I had the same problem last year and Trevi shipped them to me from their plant in Canada. The are good people to deal with. I bought a 24ft above ground from my sister this year and cant find the pieces for it. I was referred to some company in Canada and had to leave a message and wait for some one to call back. The pool is a leisure Bay Sierra. I was told the place from the place she bought it that they are not getting anymore parts for this pool and they wouldn't order them even though she has a lifetime warranty. The track looks just like yours a g track. Wouldn't all g tracks for 24 round be the same? We have owned a Bermuda King for 22 years and we are replacing the liner, I showed my husband this and he said these rails are the same as ours. The number I called for our liner which you can only use in Bermuda Pools due to the walls are not quite 48 inches tall is 800-288-8423. He said they have all the parts for the Bermuda King pools. Did you ever find these rails? We just took down one of these pools and are attempting to put up in our back yard, only problem is what you had as well... rusted bottom rails and bottom plates. I am at a dead end and wondering if you ever found where you can order these? Hello, I ordered rails for the same pool and ended up getting rid of the pool. I have them to sell to anyone that needs them. They are still in the box. E-mail me if your interested. we have a 27 ft above ground with the same rusted bottom rails and are looking for a place to get more. I don't remember the brand of the pool so will need to be able to match mine. Any help appreciated. Any radius bottom tracks you may order from this company, as long as they are 1" wide.